ONCHAN, Isle of Man – April 21, 2017 – PokerStars players have only four days left to lock in their seat to play for a $1 million first prize in the Millionaire Grand Final, an all-in shootout tournament where the winner will take home $1 million, as part of the ongoing PokerStars Makes Millionaires promotion, which runs until June. 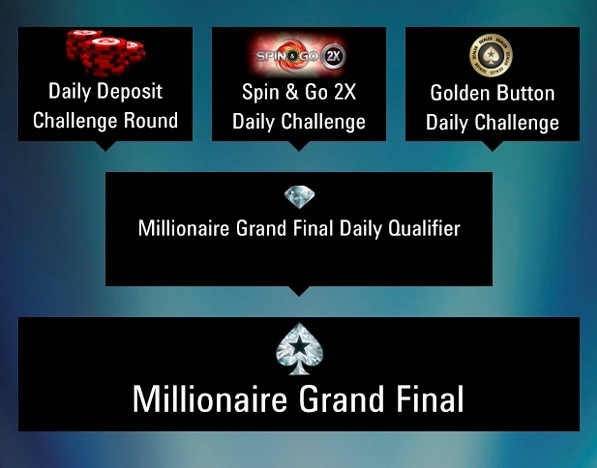 To get the chance to win the life-changing amount of money, players have to complete two qualifying rounds, the first a unique challenge and the second the Millionaire Grand Final Daily Qualifier, a heads-up shoot-out tournament, in order to make it to the Millionaire Grand Final alongside just 41 other players on April 24 at PokerStars, an Amaya Inc. (Nasdaq: AYA; TSX: AYA) brand. The Spin & Go 2X Daily Challenge - Every time players play a Spin & Go with a multiplier of 2X, they will earn points. Once they have reached 100 points, they will have completed the challenge and, in addition to winning entry to the Millionaire Grand Final Daily Qualifier, will receive a random cash reward of up to $10,000. The lowest Spin and Go stake is $0.25. The Golden Button Daily Challenge - Players can also win entry to the Daily Qualifier and collect a random cash reward of up to $10,000, through the Golden Button Challenge. Each time a player wins a Hold’em cash game hand holding an ace (including Zoom, four players minimum), they will collect points. And if they win holding an ace from the dealer button, they will earn extra points. The lowest stake for the Golden Button is $0.01. Players who successfully complete one of the challenges win a seat in the second round, the Millionaire Grand Final Qualifier, which takes place the day after each challenge at 10:47 ET. The last qualifying round takes place at 10:47 ET on April 24 just ahead of the Grand Final at 14:00 ET on the same day. The qualifier is an all-in shootout tournament with $10,000 in added prize money which sees the final three players from each daily round advance to the Millionaire Grand Final, to be held on April 24 at 14:00 ET. With the Grand Final capped at 42 players, those who make it have a 1 in 42 chance to win $1 million. The winner of the Grand Final will pocket $1 million and will be among the first of 10 millionaires PokerStars aims to create in just 10 weeks through the PokerStars Makes Millionaires promotion. The first millionaire of the PokerStars Makes Millionaires promotion was ‘Xavi666’ from Panama who won the Sunday Million 11th Anniversary tournament for $1,093,204 on April 2. Other ways to win $1 million in the PokerStars Makes Millionaires promotion are via $10 Spin and Go’s, in the Main Event 55-H and the 01-H Phase 2 SCOOP events on May 21, and in the PokerStars Championship Super High Roller from April 27 – 29 and High Roller from May 3-5 at PokerStars Championship presented by Monte Carlo Casino®.